Roddick connected with a forehand pass for a winner to get the crucial mini-break for 5-3. That was sufficient for Roddick to carry the first set. Federer came out blazing in the second set converting an early break point for 2-1. Moreover, Federer broke two more times to push the match to a decisive set. After holding serve to start the third set, with a backhand volley winner, Federer arrived at 0-40. But, Roddick found the exit, saving a fourth break point for 1 all. Next, with three winners, Roddick manufactured triple break point of his own. 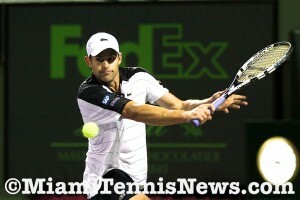 Roddick capitalized by striking a forehand pass for a winner. With Federer unable to fabricate any further break point opportunities, Roddick went on to claim the match and a spot in the fourth round. Up next for Roddick is Juan Monaco. The Argentine ousted 14th seed Gael Monfils 4-6,6-3,6-4.